Chow Alert: Pupusas on Capitol Hill! I often daydream about what it would be like to have every possible ethnicity is represented in my neighborhood’s restaurant scene. That may never happen, but we just got one step closer with the grand opening of Guanaco’s Pupuseria on Broadway. I love pupusas so this news is quite exciting. Pupusas are El Salvador’s most notable dish. They are thick handmade tortillas stuffed with a variety of fillings ranging from chicharrón (ground pork) to refried beans to cheese with loroco (a tropical vine flower). Most commonly, pupusas are made using corn masa although some regions in El Salvador use rice flour. They are traditionally served with curtido, a lightly fermented cabbage slaw. I personally love having them for breakfast with refried beans, scrambled eggs, hot sauce and sour cream. My primary experience with pupusas thus far has been at Salvadorean Bakery in Seattle’s White Center neighborhood. Their pupusas are dense and hearty. By contrast, the pupusas at Guanaco’s are very soft and practically overflowing with fillings. The thin, slightly charred exterior of the tortilla is just strong enough to hold in the soft, melty center. While I prefer the denser pupusas at Salvadorean Bakery, Guanaco’s pupusas are tasty and I’m certainly not going to complain about cheap pupusas a few blocks from my apartment! In addition to pupusas, there are plenty of other tempting items on the menu including fried plantains, yucca fritters, baby corn tamales, dessert empanadas and pastelitos (fried corn flour pockets filled with beef, onion and carrot). Everything at Guanaco’s is super cheap so there is no excuse not to try something new with each visit. Guanaco’s is located at 219 Broadway E. Suite 14 (inside the Alley Mall). My parents called me at work the other day and said excitedly, “We’re downstairs! At that waffle place!” Huh? Oh yeah, that waffle place. The one right below my office that I walk past nearly every day. Sweet Iron Waffles has been open for several months now but, for whatever reason, I had never thought to check it out. Today, I decided to remedy that. Sweet Iron serves what are known as Liège Waffles, a type of Belgian Waffle. Liège Waffles are richer, denser and sweeter than the Belgian Waffle most Americans are familiar with. They are made from a brioche-like dough and contain chunks of pearl sugar which caramelizes on the outside of the waffle while it cooks. Liège Waffles are sold by street vendors all over Belgium. I opted for a plain waffle my first time out in order to get the purest sense of what a Liège Waffle truly tastes like. It reminded me more of a sticky bun, than a waffle. It was yummy but very sweet. So sweet, in fact, that I really can’t imagine getting one topped with anything sweet (the bacon-topped waffle, on the other hand…) Sweet Iron’s waffle toppings range from the expected – chocolate, strawberries, etc. – to the more unusual such as bananas brûlée with caramel or brie and basil. They also offer seasonal waffles; current choices include cranberry-orange and date-blue cheese. The date-blue cheese waffle sounds awfully tempting. I might need to convince a co-worker to split one with me as an after lunch snack! After running a few errands around the neighborhood, Robert and I decided to swing by Po Dogs for a snack. Po Dogs is a brand new gourmet hot dog shop that opened up just down the street from us. Po Dogs’ toppings range from old classics to wacky. If you’re feeling brave, perhaps you would be interested in a dog topped with peanut butter and bananas. Or, how about the Wasabi Egg-roll Dog, a hot dog wrapped in an egg roll wrapper and deep fried with wasabi aioli on the side? We opted for slightly more pedestrian choices – a Chicago Dog for me and a Texas Dog for Robert. The Chicago Dog comes with a plethora of classic toppings: sweet relish, onions, tomatoes, dill pickles, sport peppers and a spicy-sweet mustard. The Texas Dog features mesquite BBQ sauce, Tillamook cheddar cheese and house-made crispy onion straws. Both were delicious. Any dog on the menu can be ordered beef or vegetarian (vegetarian dogs are made by Seattle’s own Field Roast Grain Meat Co.) Hot dogs are served on custom-made buns from Macrina Bakery. These delicious brioche-like buns are sweet and soft and definitely a step above your average hot dog bun (and their unique shape helps keep your dog from completely falling apart.) Po Dogs’ hot dogs are a bit on the expensive side, but that seems to be par for the course in my neighborhood these days. They did manage to brighten up a depressing, rainy Sunday – in that respect, I’d say they were worth every penny! Friday night, Robert and I headed over to Metro Cinema to see District 9. Since we were already in the University district for the movie, I thought it would be nice to grab a pint & a bite at my old stomping ground: The College Inn Pub. This dark, windowless basement pub is a haven for UW students. It is laid-back and unpretentious and attracts a good crowd (read: no obnoxious fraternity types.) The pool tables, dart boards and rotating taps provide plenty of much-needed distraction for college kids. As a geology student, I spent a good portion of my time “studying” at the College Inn Pub. The menu consists of standard pub classics including some of the best nachos in town. For $6, you get a big pile of hot corn chips topped with melted cheese, chopped fresh tomatoes, black olives, spicy jalapeño peppers and a huge dollop of sour cream. Salsa is served on the side. For an extra $1, you can have some of the pub’s delicious black bean chili added to your nachos. The jalapeños and black bean chili make these nachos truly awesome, but perhaps even more important is the fact that the nachos are well-layered. I hate it when all of the cheese is stuck on the top layer of chips and everything underneath is dry and devoid of toppings. There certainly isn’t anything fancy about this food. Still, as I sat there reminiscing about my college years, washing my nachos down with a nice, cold Old Seattle Lager, I couldn’t help but feel like it was the perfect way to top off a movie night. The College Inn Pub is located at 4006 University Way NE. Nachos are half price on Mondays! Seattle is about to experience a major heatwave so our multitude of new ice cream shops will most certainly be packed in the coming days. 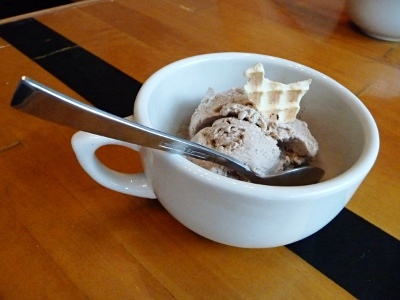 Robert and I decided to beat the rush and head out to Bluebird Homemade Ice Cream & Tea Room on Saturday night. Bluebird has been open for only a few weeks, and it is the third (yes, third!) ice cream shop to open up on Capitol Hill this summer. Like Molly Moon’s, Bluebird’s ice cream is made using primarily local and organic ingredients, and they offer uncommon flavors (stout, snickerdoodle, and peanut butter) alongside more mainstream varieties (strawberry, chocolate, etc.) There doesn’t appear to be too much overlap between the flavors at Molly Moon’s and the flavors at Bluebird which means that I’ll be able to go the entire summer without repeating an ice cream. I’m currently trying to limit myself to ice cream once per week, but it’s proving to be quite difficult! I had the distinct honor today of being the first person ever to order spam musubi from Marination Mobile. The most recent addition to the slew of food trucks opening around Seattle, Marination Mobile offers Hawaiian and Korean street food (think kalbi beef tacos, kimchi fried rice, and spam sliders.) 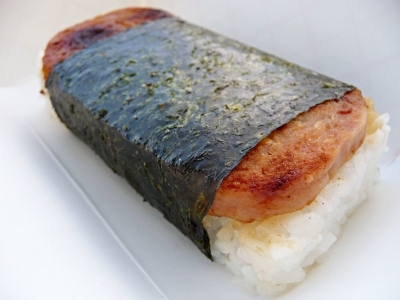 Spam musubi is an extremely popular snack in Hawaii. It consists of a slice of spam – usually fried or grilled – atop a rectangle of rice with a strip of nori seaweed holding it all together. Sometimes seasonings such as teriyaki sauce are included. Everything on Marination Mobile’s menu sounded great, but the spam musubi intrigued me the most (perhaps because President Obama famously ate one during a recent trip to Hawaii.) They were really excited when I ordered it and asked me to sign my name on the order slip (I thought this was some sort of waiver for spam musubi newbies at first but they actually just wanted to keep it as a memento.) Having never eaten spam musubi before, I was pleasantly surprised. It is very simple yet quite tasty – salty, sweet and a bit briny thanks to the nori. This humble snack is priced right at just $2 each. In fact, all of the prices at Marination Mobile are reasonable – the fried rice bowl is $5 and the tacos (which are awesome by the way) are $2 each. Marination Mobile is planning to be parked at different spots around the city. You can track their whereabouts on their website and also on twitter: curb_cuisine. People have been raving about Molly Moon’s balsamic strawberry ice cream since the day she opened for business in the spring of last year. I don’t go to Wallingford often so I hadn’t had the chance to try this delectable-sounding treat yet. Lucky for me, Molly Moon decided to come to my neck of the woods! She opened her Capitol Hill shop less than a month ago and has been doing steady business ever since (be forewarned, wait times can reach upwards of one hour on a sunny day.) I love wacky flavors so I was tempted by the salted black licorice and the pomegranate curry sorbet. However, for my inaugural scoop, I simply had to go with the balsamic strawberry. The strawberry ice cream itself was very good: rich, creamy and full of sweet strawberry flavor. The best part, though, was the balsamic reduction swirled throughout the ice cream. It’s tart flavor played well off the sweet strawberries, and it gave the ice cream a very luxurious texture. As a kid, I used to go “mining” in my family’s ice cream, digging around to get all of the best parts (cookie chunks, peanut butter threads, etc.) I would never have guessed that one day, as an adult, I would go mining in my ice cream for veins of balsamic vinegar. Balsamic strawberry ice cream may sound odd to some but, for me, it is a perfect combination of flavors. Thank you, Molly Moon! Yesterday we celebrated my nephew’s first birthday! Once the cake and presents were out of the way, our gracious host Jim invited us down to his basement bar for a tequila tasting. Jim is a true tequila aficionado, and he has clearly built his bar with that in mind. We sampled a very fine Partida reposado tequila. It was delicious unadorned – smooth and a bit spicy. The Partida was great, but I was more excited about the other tequila we tried – Lunazul – if for no other reason than it falls more in line with my budget. Priced at under $20 for 750 ml, Lunazul is a steal! Lunazul tequila is grown, distilled and bottled at the Tierra de Agaves Distillery in Tequila, Mexico. To pursue his goal of producing the best small batch tequilas in the world, former co-owner of Jose Cuervo, Francisco Beckmann, founded Tierra de Agaves in 2002. Lunazul comes in two varieties: blanco and reposado. Jim told us about how he chose Lunazul as his house tequila after conducting a blind taste test among friends. He served us the blanco in margaritas which he makes using agave nectar for sweetener, a natural pairing considering that tequila is also made from the agave plant. After returning home from the party, I headed to the corner liquor store and picked up my own bottle of Lunazul. Since we had already tried the blanco at Jim’s, I decided to buy the reposado. We sipped it straight up and in margaritas. It proved to be buttery, smoky and a bit sweet. Who knew a budget tequila could be this good? I can see why it scored so highly in Jim’s taste test. My foodie radar went off this week when I saw salt cod fritters on the brunch menu at Smith – I’m a big fan of all things salt cod. Actually, I had noticed them on the dinner menu a couple of weeks ago. For some reason, I ended up passing them over in favor of Smith’s lentils with greens and goat cheese that evening. So, when I saw that the salt cod fritters were also on the brunch menu – served with a soft-boiled duck egg no less – there was no way I was ordering anything else. They certainly didn’t disappoint! Surprisingly moist and a bit spongy in texture (in a good way) these fritters were like really awesome fish sticks. Although they were deep-fried, there was no trace of greasiness. For those who may be squeamish about trying salt cod, these weren’t overwhelmingly fishy in flavor. An order of salt cod fritters gives you four fritters, a few tiny cornichon, slices of crostini and the aforementioned duck egg which can be used as a dip for the fritters or eaten on its own. Delicious! P.S. Be on the lookout for future chow alerts in which I will feature a meal, ingredient or anything else food-related that happens to catch my eye that week.